As I See It - 2/28/2003: A sad "day in the neighborhood"
A sad "day in the neighborhood"
This week's column has nothing to do with wrestling. So if you're looking for me to talk about Paul Heyman's demotion, or the stupidity of WWE in doing so... see you next time. In the same way that I did with a column on Charles Schulz... I wanted to take some time to remember a gentle man who spoke to kids in a often violent world; a fact that's especially notable as the United States approaches a war in Iraq... Fred "Mister" Rogers. Rogers, who invited millions of children in the United States, Canada, and all over the world to "be his neighbor" as the host of CBC and PBS's "Mister Rogers' Neighborhood" for over 30 years, died after a brief fight with stomach cancer, early on February 27th at the age of 74. Fred Rogers and his "neighbourhood of make-believe" ran from 1962 to 1964 on CBC as Misterogers. It then ran regionally in cities including Boston, Philadelphia, and Washington from 1966 to 1968, incorporating segments of the CBC show into a new series. As public television grew, the show ran nationwide in first run episodes from 1968 until 2000 on public television as "Mister Rogers' Neighborhood", produced at Pittsburgh's public television station WQED. This "Neighborhood" consisted of a make-believe neighborhood of characters that taught kids basic lessons about living, whether something as simple as sharing, or as complex as dealing with the assassinations of Robert Kennedy and Martin Luther King, or in dealing with September 11th. In what was a historic first for American children's television, Rogers even travelled to the Soviet Union in 1987 to tape special segments for Mister Rogers' Neighborhood. In each show, children and their parents were taken on a magical trolley ride into the Neighborhood of Make-Believe, where Rogers's puppet creations would interact with each other and adult characters. Other times, Rogers himself would talk quietly and gently to children on the other side of the camera. Rogers was a Presbyterian minister who viewed what he did as a ministry to children and their parents. He tried to teach children how to deal with a often confusing world, and to encourage acceptance and growth through a world of imagination and fun; and to help their parents to help those very children he was speaking to through his show. Rogers always stated that he couldn't and wouldn't try to tell children that their world was sunshine and rainbows....that children, no matter how young, could sense a fraud a mile away. So the show dealt with very real-life issues ranging from birth and adoption to death, divorce, and disabilities, as well as more traditional child development issues. Even though he was a minister, Rogers's mindset was hardly preachy. In 1987, Eddie Murphy did a hilarious parody on Saturday Night Live called "Mister Robinson's Neighborhood" in which a rude, self-centered "Mister Robinson" lived in an inner-city apartment, where he taught children how to be judgmental and critical of everyone. Although some were critical of the sketches and protective of the gentle Presbyterian minister, Rogers understood the sketches were meant for an adult audience, and were meant as "funny and affectionate". There is a funny and touching follow-up about the day that Rogers met Eddie Murphy. Rogers was a guest on the Dave Letterman show one night, and decided on the spur of the moment after his appearance with Letterman to go upstairs to the Saturday Night Live studios at NBC, to surprise Murphy. Rogers went up and knocked on his dressing room door. Murphy, who grew up with the show, was described as becoming extremely emotional at meeting Mr. Rogers, with the two of them hugging. Rogers was quoted after meeting Eddie Murphy "...when I met him, finally, he was so affectionate and gentle". Rogers was also spoofed in 1999 in a far more gentle manner with a Nike ad featuring San Antonio Spurs star David Robinson and his version of "Mister Robinson's Neighborhood". The tribute extended to the point where David Robinson's own website is now named after the ads and, in a sense, after the man who he gave tribute to with them. During his 30 plus year ministry to children and their families, Rogers received two Peabody Awards, four Emmys, a "Lifetime Achievement" Award from the National Academy of Television Arts and Sciences, and the nation’s highest civilian honor, the Presidential Medal of Freedom. 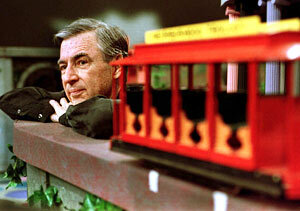 The final new "Mister Rogers' Neighborhood" episode, was taped in December 2000, and aired in August 2001. PBS affiliates have continued to air back episodes to this very day. After September 11th, 2001, Fred Rogers briefly came out of retirement to tell his children (and their parents who undoubtedly watched his show themselves as children) about the tragedy of September 11th and terrorism, and ways to deal with the emotions that many were feeling, including fear, hatred, sadness, and loss. In a sad coincidence to our present day, during the first Persian Gulf War in 1991, Rogers told his viewers that "all children should be well taken care of in this neighborhood and beyond — in times of war and in times of peace," and asked parents to promise their children they would always be safe. One hopes that Fred Rogers's vision comes true as the world approaches what may be a painful period in its history. It's sadly ironic that the episode that aired on the day Rogers died talked about one group within his "Neighborhood" that was sounding warning bells and beating a drum that everyone heard (including many who didn't want to) because they were afraid of another group that seemed very different. Fred Rogers is survived by his wife Joanne Rogers, their two sons, and two grandsons. Condolences go out to those from the generations of people who were taught by this gentle man how special they and others around them were. You can also do so online at PBSkids.com.